Zane Benefits, the #1 online small business health benefits solution, announced today the publication of two free eBooks: "Employer Health Insurance Facts and Figures - 2013" and "Individual Health Insurance Facts and Figures - 2013." The new eBooks help businesses and health insurance agents understand the current landscape of employer health insurance and indicators of future trends. 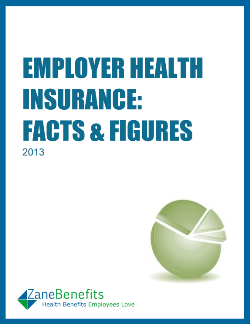 The Employer Health Insurance Facts and Figures eBook is a collection of employer health insurance trends. The data reflects overall employer health insurance with a focus on small employers who make up 82% of all US employers. The 23-page eBook examines why more than 2.3 million small businesses don't offer group health insurance to employees, and how health care reform impacts the employer health insurance landscape. The Individual Health Insurance Facts and Figures eBook examines trends specific to individual health insurance. The individual market is expected to double to over 30 million in 2014 and beyond. The concise 15-page guide provides data on the current individual health insurance market, and trends expected with health reform. Businesses, nonprofits, insurance agents, and CPAs should download these guides to learn about the current health insurance market, why employer health insurance is rapidly changing, and how to take advantage of these changes.